Red Bull driver Max Verstappen’s race car with the halo, a not particularly pretty addition to the car, over the cockpit. When Formula One mandated the halo cockpit-protection bar for 2018, a lot of people saw it as a rushed, unappealing and ugly solution to a safety issue drivers have been asking the series to solve for years. But after all of the apprehension and complaining, it sounds like the halo isn’t too terrible from the cockpit. 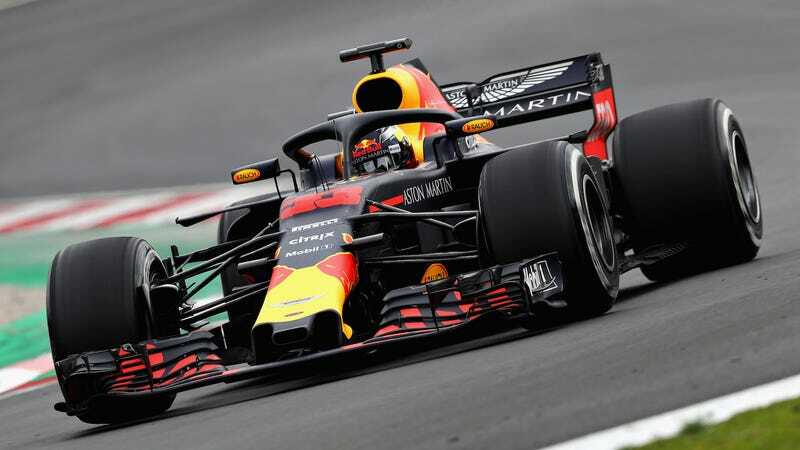 The halo is a titanium bar F1 now requires on its race cars, which can apparently hold the weight of a double-decker bus. It also makes the cars look like fast, aerodynamic flip flops. F1’s governing body, the FIA, chose the halo because it felt like the device did the best job of making the car safer, despite reports that most drivers and teams didn’t like it and wanted a different solution. Early versions of the halo didn’t only look bad from the outside, they seemed like they’d screw up the drivers’ views—after all, most people don’t choose to look at their surroundings through a thick bar. Ferrari’s Kimi Raikkonen said the view with the halo was alright in early testing, and vision from the final product didn’t look that bad in videos from last month. It also sounds like opinions have mostly gotten more favorable, even if the halo hasn’t gotten prettier. Lewis Hamilton: “You definitely notice it, you definitely lose some visibility with it. If you had 100 percent visibility [before] you’ve lost a certain percentage. But you just get used to it and as I started driving your mind learns to work around it. Fernando Alonso: “I know it’s quite a big thing from the outside — also for myself, when I see the pictures I see the Halo in the middle of the vision. But when while driving for whatever reason you are focused on long distance, you are not that focused on the middle part of the chassis. The main complaint with the halo seems to be getting in and out of the car, with Toro Rosso driver Pierre Gasly telling ESPN he ripped his fire suit doing so. ESPN quoted other drivers as saying it’s easier to get in the cars because they can use a step from the outside, but that it takes some acrobatic jumps to get out of the car with a halo—something that won’t be super easy after long and tiring races. But, overall, the halo doesn’t sound so bad from a racing perspective. It’s not hurting most drivers’ views from the cockpit, and drivers could be hurting a lot less after wrecks because of it. That’s enough to justify putting the halo on the car, whether it’s particularly attractive or not. Plus, who says halos can’t be stylish or cool looking? Silver Arrows flip flops for everyone. Just remember to put band-aids on your feet if you wear them to walk around a race track.